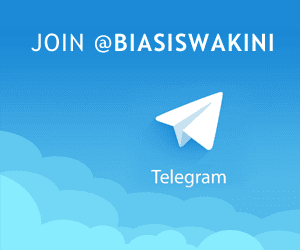 Biasiswa Maybank 2016 kini dibuka kepada seluruh warganegara Malaysia yang berminat dan berkelayakan. Achieve your aspirations with the Maybank Scholarship Award 2016. * Full education financial assistance from Pre-University/Foundation studies up to degree level at local and overseas institution (tuition fees, laptop, accommodation, and living allowance). * Career Preparatory Suite (internships, business assignment, presentation impact and effective communication). * Bond period of 3 to 5 years (varies according to schemes). * Minimum 6As in SPM 2015 or equivalent. * Total annual household income of not more than RM150,000. * Leadership experience in co-curricular activities. * Applicant must not be a recipient of any other scholarship or award from other organisation(s) or foundation. * Full education financial assistance from Pre-University/Foundation studies up to degree level at local institution (tuition fees, laptop, accommodation, and living allowance). 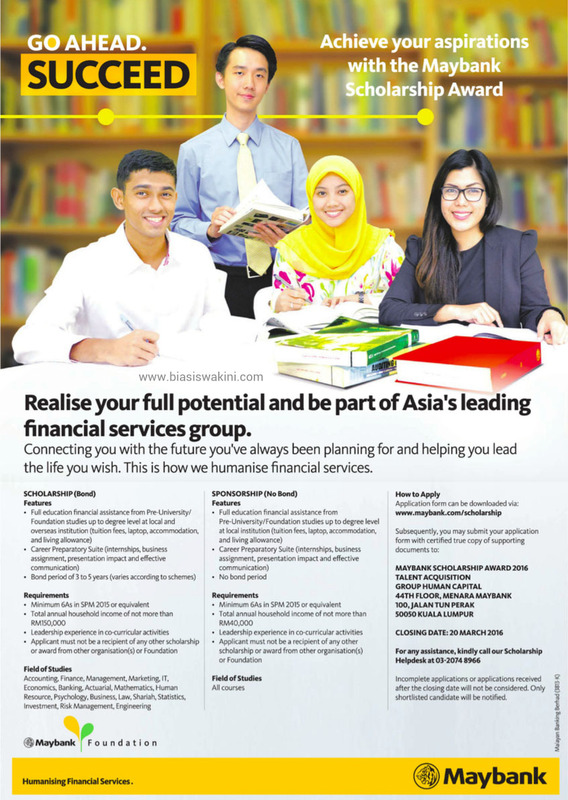 How to apply above Maybank Scholarships 2016 ? 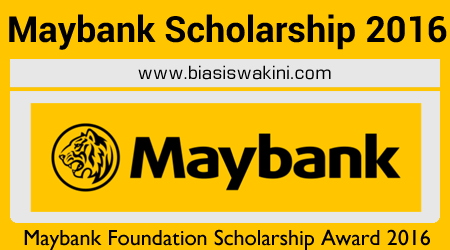 Source of Maybank Scholarship 2016 information above are taken from Maybank Scholarship Page here. 4 Komentar untuk "Maybank Foundation Scholarship Award 2016 - Biasiswa MAYBANK 2016"
the file downloaded was in pdf. so do we need to use hand writing to fill the applications form? What criterias to be chosen for the assessement?